In recent years, health & financial wellness has become an organizational priority, seeking to improve employee quality of life. When organizations choose to shoulder the responsibility of employee wellness, they are making a commitment to employees’ families, futures and overall community. As it turns out, this commitment has a positive effect on business goals and objectives. 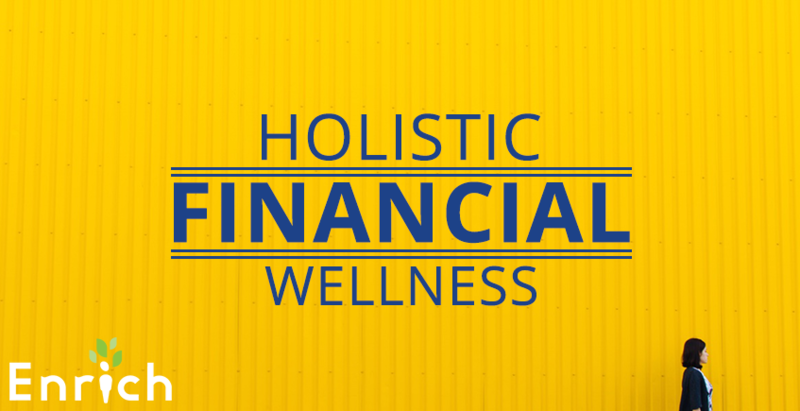 When creating a financial wellness program, there are many design options available. Enrich uses a holistic approach that seeks to engage and develop the physical, emotional, mental, and spiritual aspects of each employee. According to Maslow’s hierarchy, safety and security are the building blocks of social and personal development. Holistic financial education begins with the basics of human needs, including shelter and food, and looks to ensure security in the present and future. Physical needs vary from one household to the next. A shelter requirement for a family of 6 can be very different from that of a single 25 year old right out of college, though these views may become more aligned in 5 or 10 years. When these needs are addressed, employees will find a course of study that is relevant to their lifestyle and works towards their goals. Research shows that high levels of stress contribute to health problems which cause companies to incur costs due to healthcare, productivity loss and absenteeism. One of the measures companies can take to help alleviate employee stress is to address one of its leading causes: financial problems. By educating employees on the financial options available to them, organizations are able to empower employees to take control of their financial futures and alleviate the stress that arises out of uncertainty. Financial pressures are stressful by their own right, but they intersect with other areas of personal life. Family life, marriage, worldview and social life are intimately connected with a person’s financial state--financial issues being one of the most cited reasons for divorce and family strife. Emotional turmoil related to these areas contributes to absenteeism and turnover, which shifts the burden of daily operations onto other members. This shift has the potential to increase burn-out and absenteeism, further exacerbating the problem. Providing a platform for employees to secure their financial well being not only improves their quality of life, but it allows them to shelter others from the problems that arise out of a lack of financial awareness. People are motivated to wake up and show up to work for countless reasons. For some it is access to a social standing, for others it can be to fulfill a passion, but at the end of the day it's the check that can put food on the table and a roof over our heads. With so pragmatic a motivation, it is easy to lose sight of the other aspects that inform our decisions to clock in. Humans are constantly looking for meaning and purpose, and we are blessed with a desire to belong to a community. Employees are not just looking to provide for themselves, they are looking to provide for their families. Communities of like minded individuals, whether peer or expert, embed members in a social structure that is built with their success in mind. In these social spaces, questions can be addressed, like in the Enrich forum or live Q&A sessions, or webinars addressing different topics. Building a space where people can learn together, and developing a program tailored to their specific needs allows organization members to have a hand in securing their future and immediately applying what they learn. As businesses make the shift from employer-employee relations to a holistic one of team membership and goal accomplishment, organizations can leverage their unity and resources to provide an education that has the potential to impact a generation.